♥ to block Bad Nenndorf in a good dress ! As every year hundreds of neonazis will try to march in the northern german town Bad Nenndorf in just two weeks again. And also this year the Initiative Kein Naziaufmarsch in Bad Nenndorf calls for antifascist blockades. We now have the perfect dress for that day, of course all profits of these official solidarity shirts directly will be forwarded to support the antifa mobilisation. 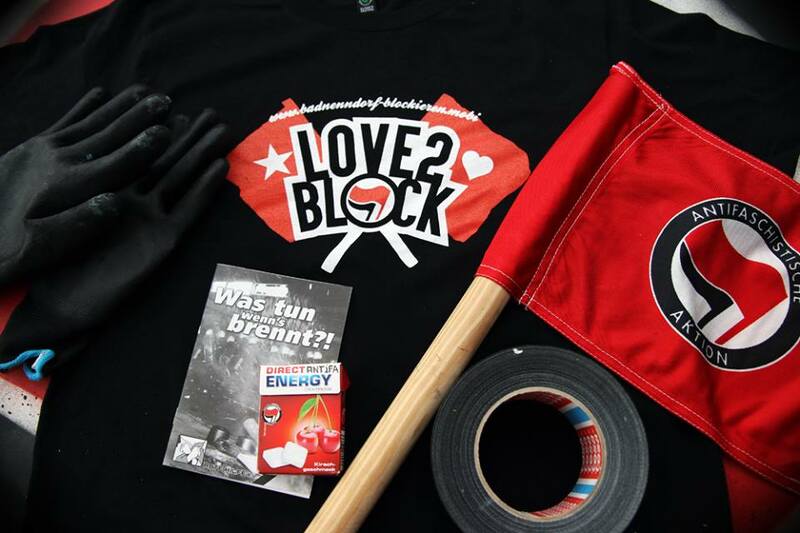 Come to Bad Nenndorf on august 1st 2015, stop the nazis and get your personal „♥ to block“ shirt here: Boiz / Grrrlz. The must be at appointment of the weekend (for those of you without good excuses or exclusive programs like having, for the 8th time in 3 years, surgery)…. For those of you in and around Goettingen, departure is at 7 am from the train station. More infos here. Otherwise…please, please see this video. The dancing antifa invites you to Bad Nenndorf! Du browst gerade in den Fire and Flames Weblog-Archiven nach dem Tag 'bad-nenndorf'.